There are many STAINLESS STEEL BOWLS on the market, but none like the Midwest Snap'y Fit Bowls. 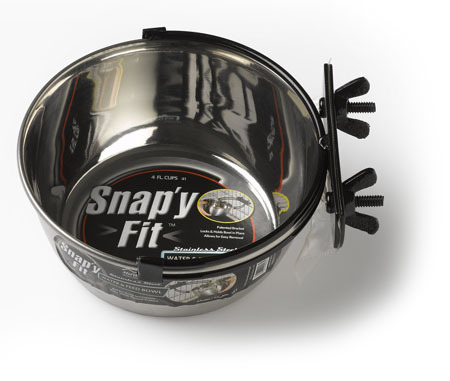 The Midwest Snap'y Fit patented system holds the bowl firmly in place and yet, allows easy removal. Pet parents have been frustrated for years with conventional water bowls because pets can dislodge the bowls and spill the food and water. The Snap'y Fit patented system solves this problem. The bowls are available in 10fl. ounce, 20 fl. ounce, 4 fl. cup & 8 fl. cup (1 and 2 qt.) sizes. 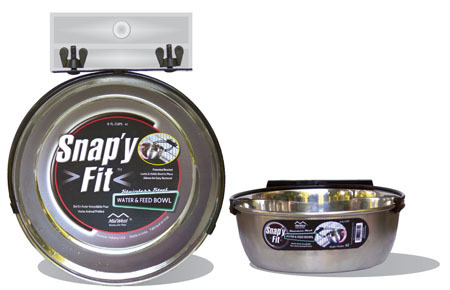 Midwest Snap'y Fit Dog Bowls can be attached to Dog Crates and Exercise Pens! 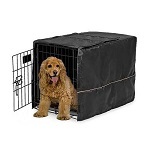 Frank from UT wrote: "The Midwest Snap'y Fit Stainless Steel Crate Bowl is the best thing to put in a crate except the dog."